A popular dog lead that can be used at half / double the length, simply extend the lead to double the size! A personal favourite for putting over your shoulder when out enjoying your dog walk. 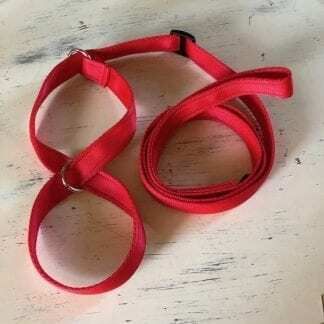 These dog leads are soft to the touch yet still hard wearing. Machine washable so comes up like new. The length of the lead stated in the options is the full length of the lead, then halved when doubled over. The double length lead, one of our most popular items, made to be used at 2 different lengths and ideal for training the walk to heel and matches nicely with our dog collars. The beauty of these leads are they are soft and strong, they last forever and with our Lifetime Stitching guarantee, you have peace of mind. Image shows Nala wearing a Half-Check Dog Collar with royal blue double up dog lead in 25mm width and nickel fittings. Many people buy a collar to match as all our leads can be matched with dog collars too. They come in a selection of colours, but the good old favourites of black, red and navy are the most popular. This leash is made with a trigger hook and an O ring at one end, with an O ring on the handle too. When you pull the webbing through the O ring at the bottom and feed it through, it comes to a stop at the O ring on the handle, making the lead half its’ length. It can be used at full length with a handle at the end or half-length when the bit you hold is the halfway point. The double up lead is a top recommendation. 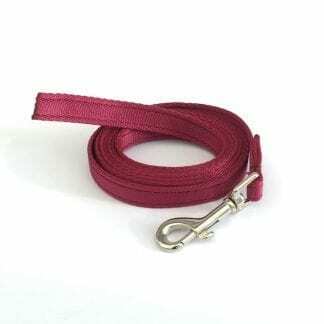 The 2-metre double length dog lead at 1 metre it is an ideal walking length. At 2 metres fully extended it gives your dog a bit more sniffing freedom and room to investigate his sensory environment. 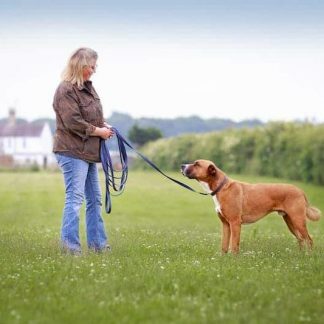 For full off lead walking, the 1 – 2-metre lead can be put over your shoulder. You can then enjoy your walk with your pooch. 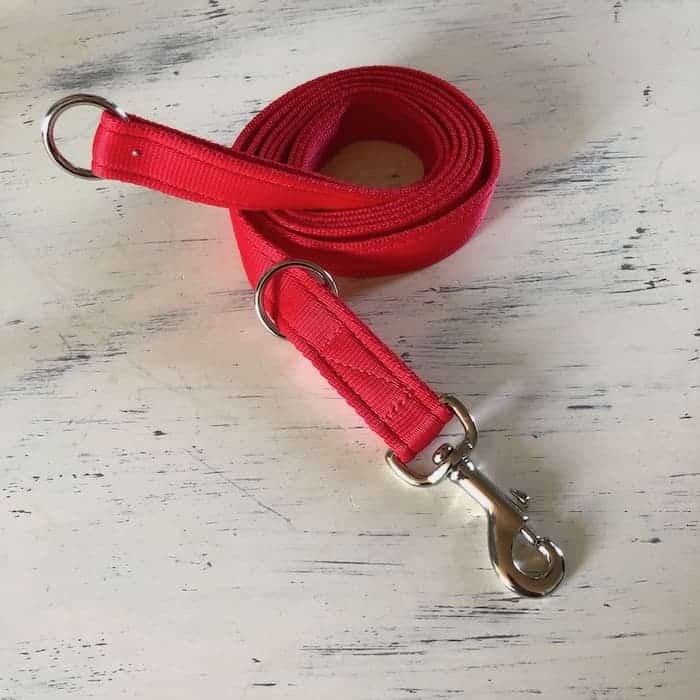 Also comes in longer lengths so you can choose the ideal length for you and your dog. 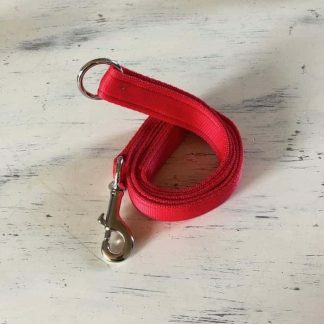 All our dog leads come with a lifetime stitching guarantee. So you can rest assured that in the unlikely event your lead develops a stitching defect, we will replace it for you completely free of charge. This leash is ideal for close work such as training the walk to heel or road walking (close to traffic). The webbing we used is called cushion web, and that’s just how it feels in your hands. 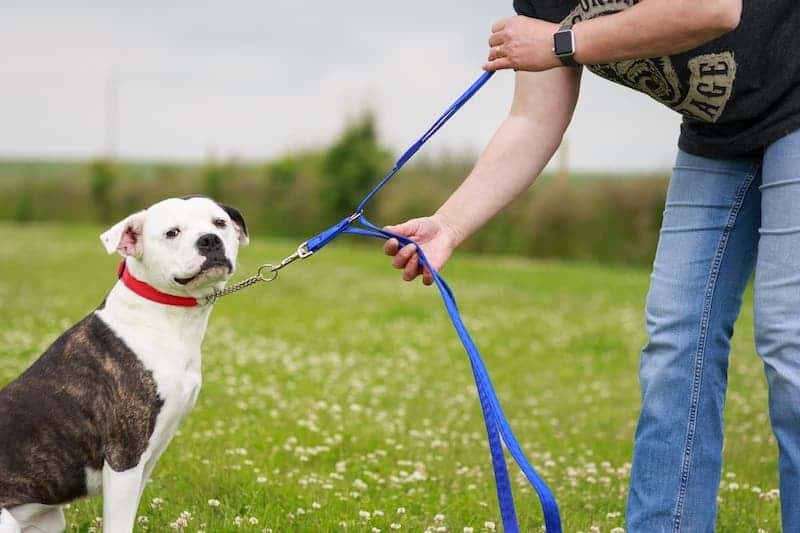 If you want to let your dog off the lead, the double-length dog lead can be looped over your shoulder. 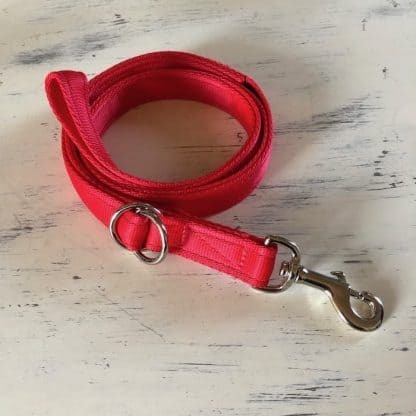 Alternatively, this leashes’ unique design means that within 2 seconds you can double the length of it, giving your dog a bit more freedom to stiff around at all those interesting smells. I love Meg Heath leads, and have now ordered three different configurations, all which help me to walk, train and support my reactive greyhound. The quality is second to none and I love the option of choosing brass fittings – their extra strength makes me feel more secure should anything happen. Been using those double up leads for training, they are a great length and doubling up is just right too for when they need to be closer, as in the visit to the vet!! All your equipment feels extremely ……………..(can’t think of word looking for) robust! substantial!!! Very pleased with harness and lead supplied. Will buy again. A great product fast delivery we have been using the lead for a while now and we are really pleased with the quality. Hi Sarah, I am really pleased with the 2 metre red dog lead purchased from you. I had the wider of the 2 widths available. I wasnt confortable with the idea of an extending lead so chose yours instead which gives my puppy an ability to get that bit further away but i am in full control using your lead. Thank you and kind regards. Yes everything is great with the order. The lead arrived as quick as the post would allow 🙂 Unwrapped it, connected to the collar, then straight out for a walk, perfect !!! The extra length in the lead is just what he needs to allow him to sniff in the bushes and enable me to keep control of him . Thanks for the prompt service, will recommend should someone ask from where i purchased it ! I was very impressed with the speed of service and the quality of workmanship when my leads arrived. Sadly, I had misunderstood the nature of the leads and had to return them as they were not quite what I was looking for but, again, the service was very friendly and efficient and my refund was credited promptly to my card. Just to thank you for sending the double up lead and collar so promptly. I had an extra long longline made by you a year or so ago which I have found invaluable.It is really practical – soft to the hands in use with no risk of friction burns and soon dries out if wet. Although my little cockerpoo is now more reliable, it allows him to safely have a certain amount of freedom in areas where control of an animal is required. I am equally pleased with the double up lead and it is exactly what I need as it gives flexibility in general walking circumstances. I have often looked for a wider webbed collar for smaller dogs and yours is soft and comfortable. I frequently recommend your products to others, carrying a small card with your details on.